A team of researchers have discovered millions of cyanobacteria living 613 metres under the earth’s surface. This discovery is particularly surprising as cynobacteria normally need light to be able to survive. The Rio Tinto region of Spain has an unusual countryside that is rich in iron which has similarities to the some of the landscapes found on Mars. Micro-organisms which are usually dependent on sunlight have also been found in this area 600 m underground. This discovery was made after recent excavations in the bottom of an abandoned mine. 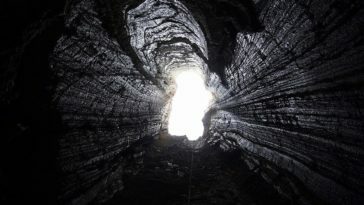 Sample segments from the research team of the Spanish Astrobiology Centre in Madrid have revealed the presence of cynobacteria in the hollow of the rocks. However no light can reach this far underground. “In the desert, you can find cyanobacteria, in the sea you can find cynobacteria, in the International Space Station you can find these microbes take them back and they will survive,” explained Fernando Puente-Sánchez, the leading author of the study published in Actes de l’Académie nationale des sciences journal. “The last habitat that we would have ever analysed is underground.” But how do these microorganisms which normally need sunlight survive without photosynthesis ? The seem to pull their necessary energy from hydrogen. If their contemporaries – even in the darkest places – manage to capture photosynthesizing energy so that they can separate water and make electrons during photosynthesis, these cynanobacteria, deprived of light have managed to evolve so that they can survive off hydrogen to get their energy. There was less hydrogen in the places where microbes were found in comparison to where they were absent. This is another piece of evidence highlighting the ultra resilience of micro-organisms and emphasises that they are perfectly capable of adapting to extreme environments. It is also good news for future research into microbial life underground on Mars, where there is no water and no light from the Sun.